This morning I stopped by my dear friend Linda Rhodes’ house for a cup of tea. While I was there she let me photograph some of her doll quilts and I wanted to share a few of them with you. This first one is my favorite. 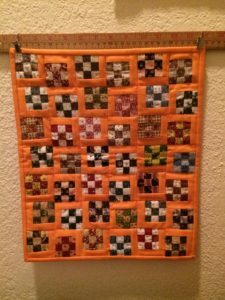 It is little 9-patch blocks set on two sides with a beautiful cheddar orange fabric. Turning each block up, down or sideways makes an interesting setting. 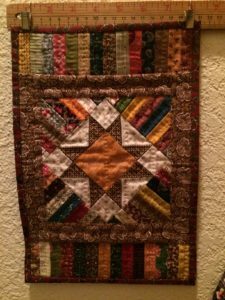 You will notice in these pictures that she has a unique way of displaying her quilts. She mounts vintage yard sticks on the wall and then uses little clips to hang each quilt on the yardstick. It makes it easy to change which quilts are hanging and in which order. This 2nd quilt is also a 9 patch but in a more traditional setting, on point. Of course, I chose this third quilt because it also has cheddar. This time it is combined with red which makes a stunning combination. 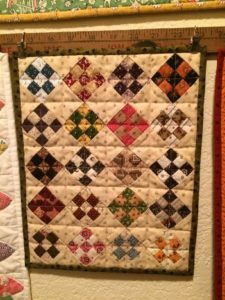 The original antique quilt is from the book Small Endearments. Linda made a wonderful reproduction. 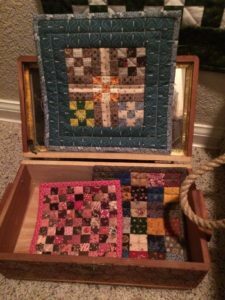 Some of her smallest quilts are in a little trunk and they look adorable. I love it when doll quilts can be displayed anywhere. The last quilt is one of Linda’s favorites. I think the scrappier they are, the more she likes them. This one is beautifully hand quilted. I guess that’s the advantage of making doll quilts. 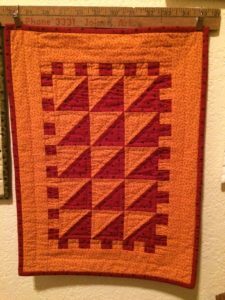 You can practice your hand quilting and it doesn’t become overwhelming. Personally, I have never tried to hand quilt a queen-sized quilt but it’s easy to do a doll quilt. ← V is for Volume Discount!